Although the dtc titles say oxygen sensor, these dtcs relate to the air-fuel ratio (a/f) sensor. The a/f sensor generates a voltage* that corresponds to the actual air-fuel ratio. This sensor voltage is used to provide the ecm with feedback so that it can control the air-fuel ratio. The ecm determines the deviation from the stoichiometric air-fuel ratio level, and regulates the fuel injection time. If the a/f sensor malfunctions, the ecm is unable to control the air-fuel ratio accurately. The a/f sensor is of the planar type and is integrated with the heater, which heats the solid electrolyte (zirconia element). This heater is controlled by the ecm. When the intake air volume is low (the exhaust gas temperature is low), a current flows into the heater to heat the sensor, in order to facilitate accurate air-fuel ratio detection. In addition, the sensor and heater portions are narrower than the conventional type. The heat generated by the heater is conducted to the solid electrolyte through the alumina, therefore the sensor activation is accelerated. In order to obtain a high purification rate of the carbon monoxide (co), hydrocarbon (hc) and nitrogen oxide (nox) components in the exhaust gas, a twc is used. For the most efficient use of the twc, the air-fuel ratio must be precisely controlled so that it is always close to the stoichiometric level. *: Value changes inside the ecm. Since the a/f sensor is the current output element, a current is converted into a voltage inside the ecm. Any measurements taken at the a/f sensor or ecm connectors will show a constant voltage. When either of these dtcs is set, check the a/f sensor output voltage by selecting the following menu items on the intelligent tester: diagnosis / enhanced obd ii / data list / primary / afs b1 s1. Short-term fuel trim values can also be read using the intelligent tester. The ecm regulates the voltages at the a1a+ and a1a- terminals of the ecm to a constant level. Therefore, the a/f sensor output voltage cannot be confirmed without using the intelligent tester. 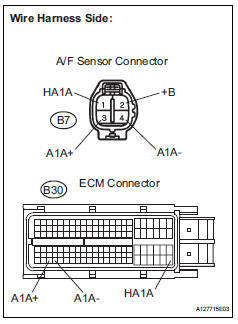 If the a/f sensor is malfunctioning, the ecm sets the dtc p2195 or p2196. 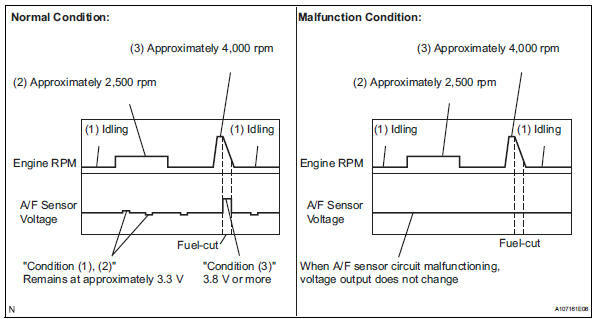 Under the air-fuel ratio feedback control, if the a/f sensor output voltage indicates rich or lean for a certain period of time, the ecm determines that there is a malfunction in the a/f sensor. The ecm illuminates the mil and sets a dtc. Example: if the a/f sensor output voltage is less than 2.8 V (very rich condition) for 10 seconds, despite the rear ho2 sensor output voltage being less than 0.6 V, the ecm sets dtc p2196. Alternatively, if the a/f sensor output voltage is more than 3.8 V (very lean condition) for 10 seconds, despite the rear ho2 sensor output voltage being 0.15 V or more, dtc p2195 is set. A rich air-fuel mixture causes a low a/f sensor current, and a lean air-fuel mixture causes a high a/f sensor current. Therefore, the sensor output becomes low during acceleration, and it becomes high during deceleration with the throttle valve fully closed. 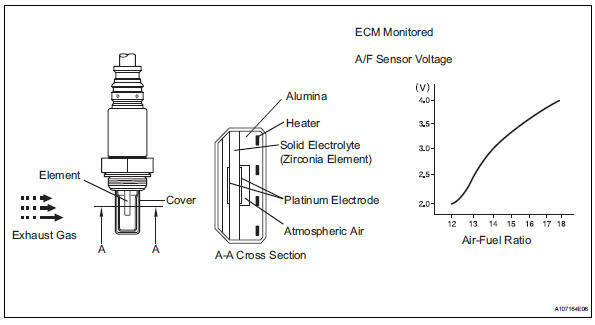 The ecm monitors the a/f sensor current during fuel-cut and detects any abnormal current values. 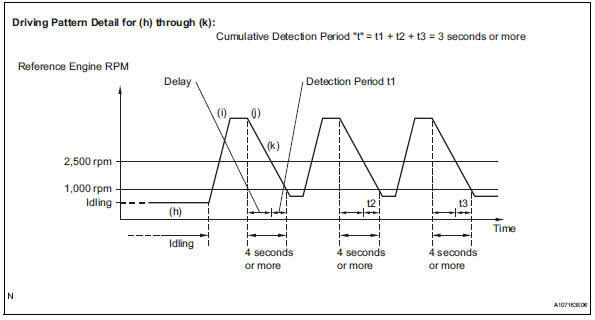 If the a/f sensor output is 3.6 Ma or more for more than 3 seconds of cumulative time, the ecm interprets this as a malfunction in the a/f sensor and sets dtc p2195 (high-side stuck). If the a/f sensor output is less than 1.0 Ma for more than 3 seconds of cumulative time, the ecm sets dtc p2196 (low-side stuck). Start the engine, and warm it up until the ect reaches 75°c (167°f) or higher. On the intelligent tester, select the following menu items to check the fuel-cut status: diagnosis / enhanced obd ii / data list / user data / fc idl. Drive the vehicle at between 60 km/h (38 mph) and 120 km/h (75 mph) for at least 10 minutes. Change the transmission to 2nd gear. Drive the vehicle at proper vehicle speed to perform fuel-cut operation. Engine speed is 2,500 rpm or more (fuel injection returns at 1,000 rpm). 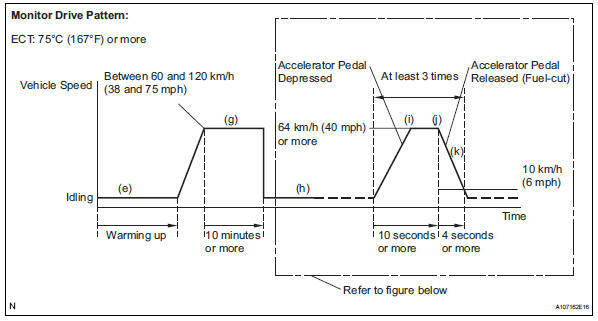 Accelerate the vehicle to 64 km/h (40 mph) or more by depressing the accelerator pedal for at least 10 seconds. Soon after performing step (j) above, release the accelerator pedal for at least 4 seconds without depressing the brake pedal, in order to execute fuel-cut control. Allow the vehicle to decelerate until the vehicle speed declines to less than 10 km/h (6 mph). Repeat steps from (h) through (k) above at least 3 times in one driving cycle. Strictly observe posted speed limits, traffic laws, and road conditions when performing these drive patterns. Monitor the output voltages of the a/f and ho2 sensors (afs b1 s1 and o2s b1 s2) displayed on the tester. 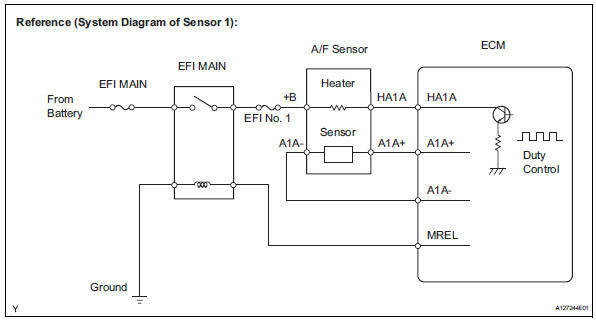 The a/f sensor has an output delay of a few seconds and the ho2 sensor (sensor 2) output has a maximum output delay of approximately of 20 seconds. To display the graph, select the following menu items on the tester: diagnosis / enhanced obd ii / active test / a/f control / user data / afs b1 s1 and o2s b1 s2, and press the yes button and then the enter button followed by the f4 button. Connect an intelligent tester to the dlc3. Drive the vehicle in accordance with the drive pattern described in the confirmation driving pattern. 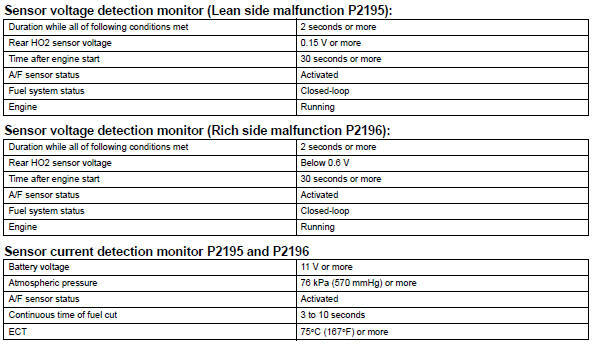 Select the following menu items: diagnosis / enhanced obd ii / monitor info / monitor status. Check that the status of o2s mon is compl. If the status is still incmpl, drive the vehicle according to the driving pattern again. Avail indicates that the component has not been monitored yet. Compl indicates that the component is functioning normally. Incmpl indicates that the component is malfunctioning. Select the following menu items: diagnosis / enhanced obd ii / monitor info / test result / range b1 s1; then press the enter button. 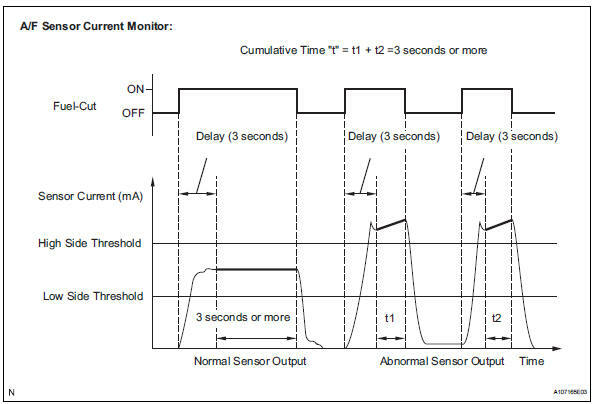 Check the test value of the a/f sensor output current during fuel-cut. Warm up the a/f sensor at an engine speed of 2,500 rpm for 90 seconds. On the tester, select the following menu items: diagnosis / enhanced obd ii / snapshot / manual snapshot / user data / afs b1 s1 and engine spd. Check the a/f sensor voltage 3 times, when the engine is in each of the following conditions: (1) while idling (check for at least 30 seconds) (2) at an engine speed of approximately 2,500 rpm (without any sudden changes in engine speed) (3) raise the engine speed to 4,000 rpm and then quickly release the accelerator pedal so that the throttle valve is fully closed. For more information, see the diagrams below. 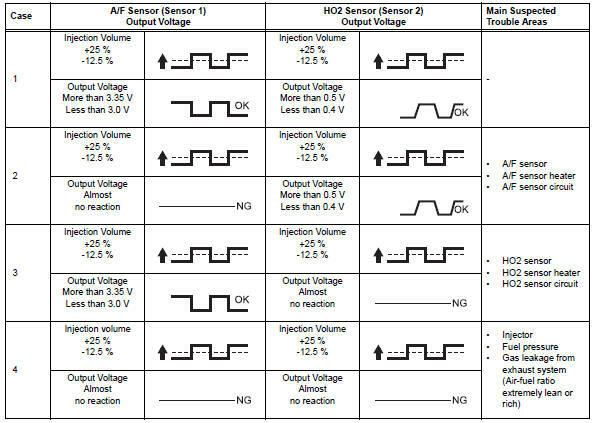 If the output voltage of the a/f sensor remains at either approximately 3.8 V or more, or 2.8 V or less (see malfunction condition diagram) under any conditions, including those above, the a/f sensor may have a short circuit. The ecm stops fuel injection (fuel cut) during engine deceleration. This causes a lean condition and result in a momentary increase in the a/f sensor output voltage. The ecm must establish a closed throttle valve position learning value to perform fuel cut. If the battery terminal has been reconnected, the vehicle must be driven over 16 km/h (10 mph) to allow the ecm to learn the closed throttle valve position. When the vehicle is driven: the output voltage of the a/f sensor may be below 2.8 V during fuel enrichment. For the vehicle, this translates to a sudden increase in speed with the accelerator pedal fully depressed when trying to overtake another vehicle. The a/ f sensor is functioning normally. 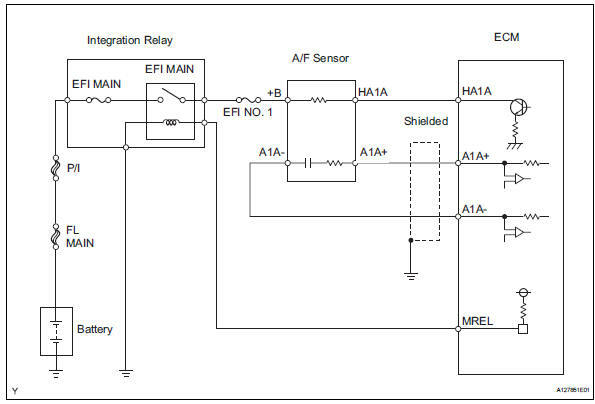 The a/f sensor is a current output element; therefore, the current is converted into a voltage inside the ecm. Measuring the voltage at the connectors of the a/f sensor or ecm will show a constant voltage result. Read dtcs using the intelligent tester. Disconnect the b7 a/f sensor connector. Measure the voltage between the +b terminal of the a/f sensor connector and body ground. Reconnect the a/f sensor connector.